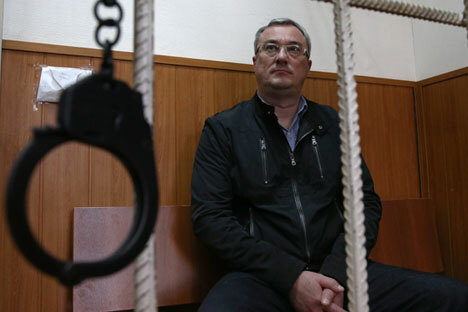 Russian law enforcers have arrested Vyacheslav Gaizer, the head of the Komi Republic, one of Russia’s largest regions, accusing him of creating an organized criminal group – the first time in Russia's recent history that a governor has been accused of such serious charges. Russian law enforcers have arrested Vyacheslav Gaizer, the head of the Komi Republic, one of Russia’s largest regions, accusing him of creating an organized criminal group. Russia’s Investigative Committee reported on Sept. 19 that a criminal case had been opened against 19 members of a criminal group, headed by Gaizer. Including Gaizer, 15 suspects have been taken into custody as part of the case. The Investigative Committee has said it is trying to locate and arrest the remaining suspects in the case. Those arrested included senior officials of the region: the deputy governor, deputy prime minister of the republic’s government, the regional head of the State Council and a former representative of the Komi Republic in the upper house of the Russian parliament. The criminal case was opened under two articles – “criminal association” and “fraud.” According to the Investigative Committee, the investigation into Gaizer began nine years ago. According to ministry spokesman Vladimir Markin, Russian IC investigators in conjunction with FSB officers carried out more than 80 searches in three Russian provinces in connection with the case. Vyacheslav Gaizer has been governor since 2010, when he was recommended to the post by then-President Dmitry Medvedev. He was re-elected in 2014, receiving 80 percent of the electoral vote. He is a member of the Upper Council of the ruling United Russia party. According to the source, “the Gaizer team’s” interests extended to numerous profitable businesses in the area of energy and housing. The agency was informed by the republic’s prosecutor’s office that Gaizer and his associates are suspected of the illegal privatization of a series of enterprises in Komi, including poultry farms and several hotels. The case also refers to illegal schemes for a whole range of other companies in the republic. Evidence of ineffective law enforcement? The case against Gaizer is a testament to the ineffectiveness of the fight against corruption, said Vladimir Rimsky, an investigator from the INDEM Center dealing with the problems of corruption, in an interview with RBTH. "The most important thing here is that even according to official reports from the Investigative Committee, the group, which included more than a dozen officials, was able to operate for nine years. Either it was not operating, and this is all made up, or if it was operating, then everyone [in the region] associated with property and public procurement should have known about it. None of this was [known]," he said. Rimsky believes that the issue is a group of corrupt officials, but that there was no hierarchy for an organized criminal group in the precise meaning of the phrase – it was only after the arrest of a group of senior officials from the Komi Republic that it was presented as such. “In this case we are talking about a person who was nominated by the president. Therefore, a full package of documents needs to be provided to the president,” said Kabanov, linking this with length of time taken to arrest Gaizer. Kabanov said that corruption schemes are a highly organized system, which includes both government officials and businessmen. He said that there are gaps in the Criminal Code of the Russian Federation and there is no article capable of punishing embezzlement of state funds in proportion to the gravity of the crime.